A machine or product’s purpose is to satisfy a need. Adept’s engineering methods begin each prospective project by understanding everything related to your idea. In what will prove to be the first of many discussions, a collaborative exchange will ensue to understand each desired functionality, appearance and objective of your project. Throughout this exchange, Adept will focus on a comprehensive detailed approach to create a functioning device which satisfying the need and meets all your objectives. In the military and aerospace industry this takes the form of detailed specification and statement of work. Outside of those industries we strive to develop similar documents assuring that Adept and it’s Clients are working in concert, effectively and efficiently. 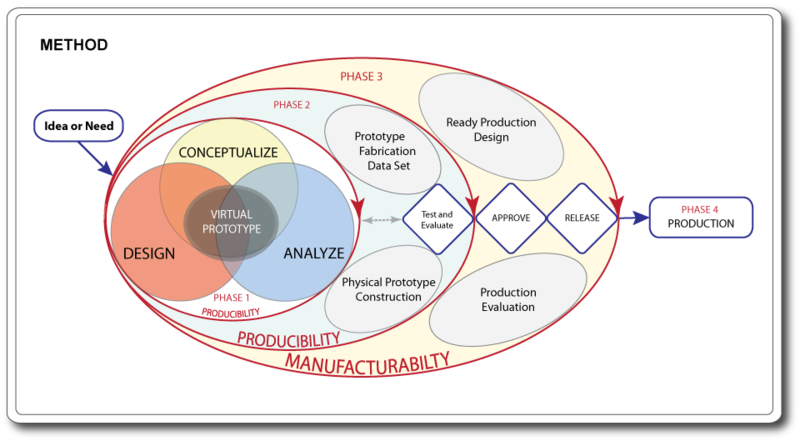 The diagram above is a broad stroke that summarizes our methodology. For scheduling, planning and presentation convenience, we choose to display this process sequentially; however the process of Engineering and creation is fluent and each phase must keep in check the subsequent phases, whereas, no phase is ever performed without consideration of the whole picture. From the first instant of ideation, Adept is foreseeing and planning for reality. Continually orchestrating the need for Mechanical Engineering, Electrical Engineering or Industrial Design. Computer modeling and analysis grants use tremendous foresight, thus reducing the number of physical prototypes necessary to get you to your goal. Prototype are a necessary element in the Design and Engineering process. Despite the insight our computer models and analysis affords us, there comes a time for hands on feel and/or testing. Please flip through the slides to gain further insight into this exciting and revealing process.